Here’s the 12th portrait in Streetsblog’s weekly “Why I Ride” series. Andrew is a New Jersey native, a longtime Brooklyn resident, and a painter. 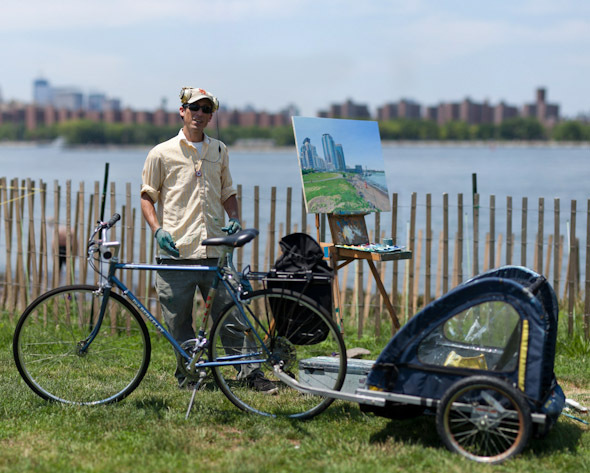 I happened upon him and his bike/trailer at the waterfront park in Williamsburg, where he was completing a depiction of the new condominiums along the water. As it turns out, Andrew didn’t become a New York cyclist primarily for exercise or recreation, but out of a kind of professional necessity. He still uses his car as a main mode of transport, but the bike has become an indispensable tool for his work. Now he loads his bike and trailer into his car and drives from his Flatbush home to the location he wants to paint. After securing a safe parking spot, he rides the rest of the way. In addition to allowing him and his equipment access to more parts of the city, his new method has spurred him to ride more often just for the enjoyment of it. A mass bike ride planned through social media on Sunday came to an abrupt end when NYPD set up a roadblock and arrested more than a dozen kids, in some cases causing physical harm. The police response was excessive and uncalled-for, according to one older participant, who's looking into getting permits for future rides.